Being part 3 of a series of tutorials for the Mawata Colossus project. 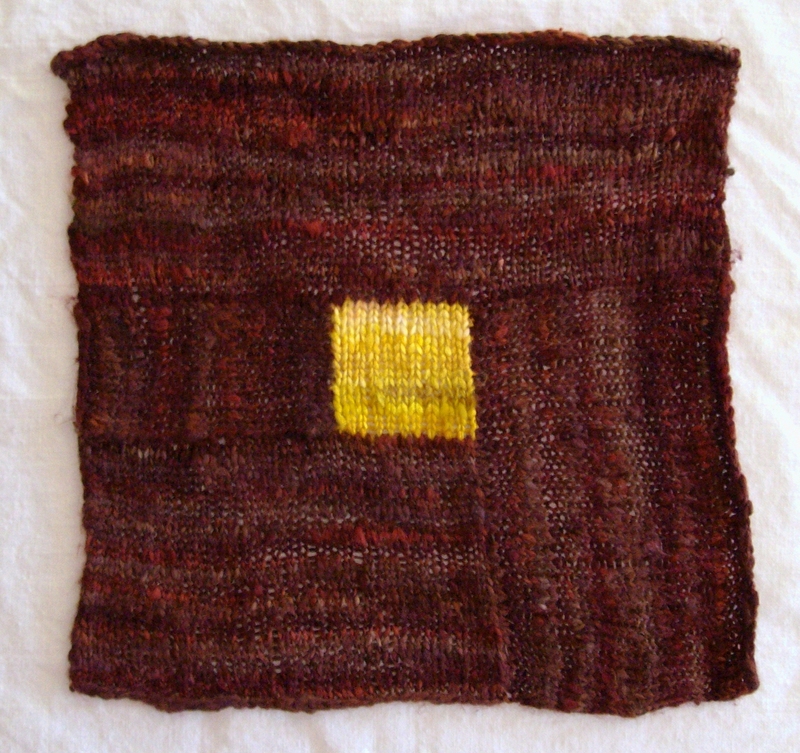 The first part explains how to knit with mawata or silk hankies, and the second gives a recipe for the Picture Window block. Because mawata don’t come in a standard yarn weight and you may have your own preferences for the gauge and size of your blocks, these posts describe how I make the blocks and give guidelines on making your own. They’re more sort of recipes, rather than proper tested, tech edited patterns. So you’ve got a few (or one, or several) Picture Window blocks, and you’d like to vary the rhythm a bit, or perhaps you’d like to include just a bit of one colour instead of a big block. For instance, when Cupcake Joan discovered my mawata obsession, she surprised me by tucking some beautiful hankies from her own stash into my Cupcake Fiber Co. order, including a stack in a rather lovely, sunshiney yellow. Now, I’m not always comfortable with yellow, and working a big section of yellow into the colours I was using would be a challenge, but I just had to have some of that sunshine in my blanket. 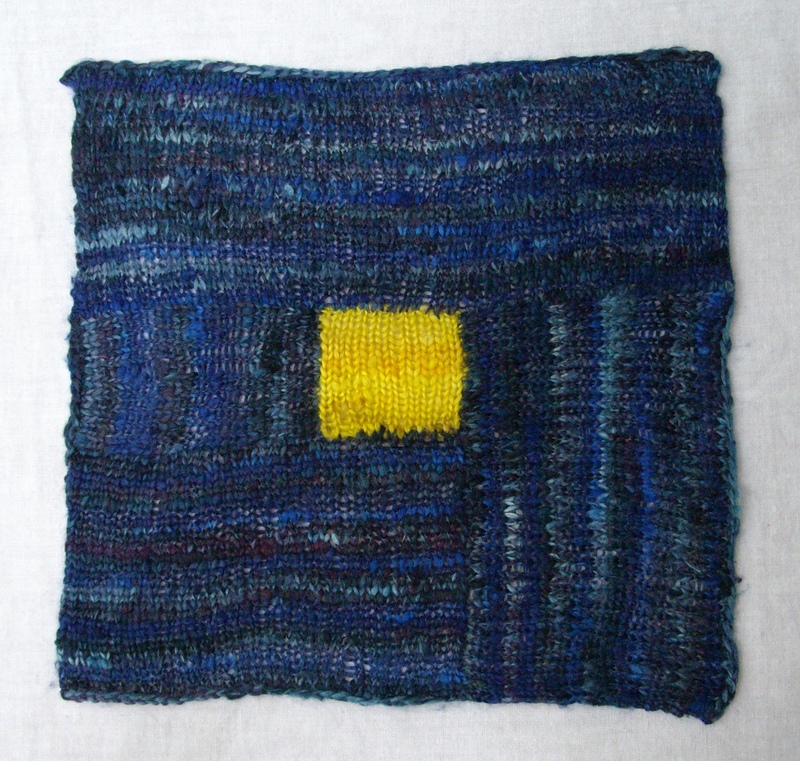 Enter the Peephole block: a small centre square with a nice, wide border, kind of like a peephole in a door. But square. Yes, I’m stretching the metaphor here. With your centre colour, cast on 12 sts. Work 15 rows in stockinette, knitting the first and last stitch on each side to form the selvedge. Bind off all sts. Now for a math interlude. 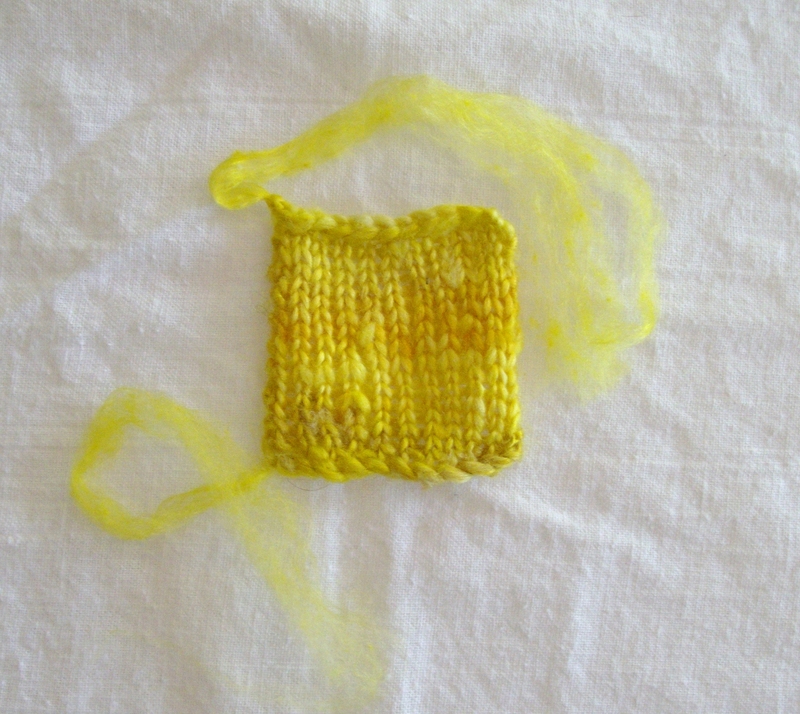 We have the totals from the last block: for each block to be the same size, it needs to be 54 stitches by 80 rows. Taking the centre rows from the total rows leaves us 65; dividing the remainder between the two borders gives us 32.5 rows per border, including the pick up rows. We need an even number of rows to end the bind off in the left corner for the next round of picking up (thus leaving us with fewer ends to weave in), so we’ll round that down to 32 rows including the pick-up row. The total will be one row off, but as we say in knitterland, that sh*t will block right out. So. In your border colour, pick up 12 sts along the side of your centre square (2 sts for every 3 rows, plus one at each corner), and work another 31 rows, ending with a purl row. 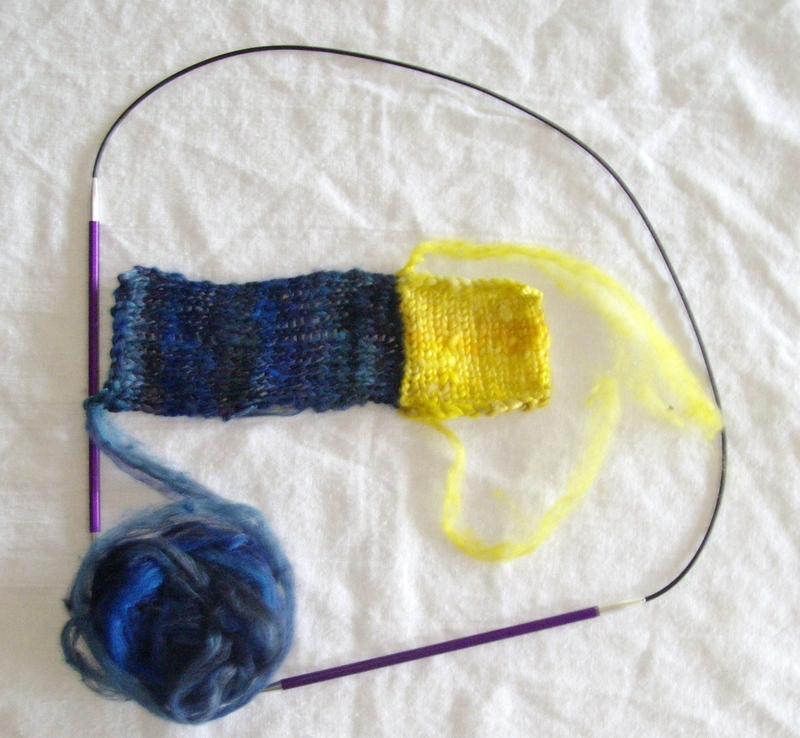 Bind off, leaving the last stitch on the needle as the beginning of the next border section. Turn your work clockwise and pick up 21 sts along the side of that last border piece (so 22 including the live stitch from the last section), then 11 sts along the bottom of your centre square. Work 31 rows in stockinette, starting and ending with a purl row, and bind off, again leaving the last stitch on the needle. Turn your work clockwise and repeat what you did for the second border section to make your third border section. Can you believe that not one of the photos of the third border section turned out? Not one. Not even by the rather questionable standards of that first border section photo. My apologies. I’m pretty sure you know where we’re going here, though. Turn your work clockwise, and pick up 21 sts along the side of the third border section, 10 sts along the top of the centre square, and 22 sts along the side of the first border section. Voilà: with the live stitch from the third border section, you have your 54 stitches. Work 31 rows in stockinette, again starting and ending with a purl row, then bind off. Weave in your ends (there shouldn’t be too many if you’re overlapping the ends of your hankies and snipping off any wayward tips) and block. I’m tempted to do a whole blanket just using these blocks. *Where the heck are the selvedge rows in all this math, you ask? Oho! 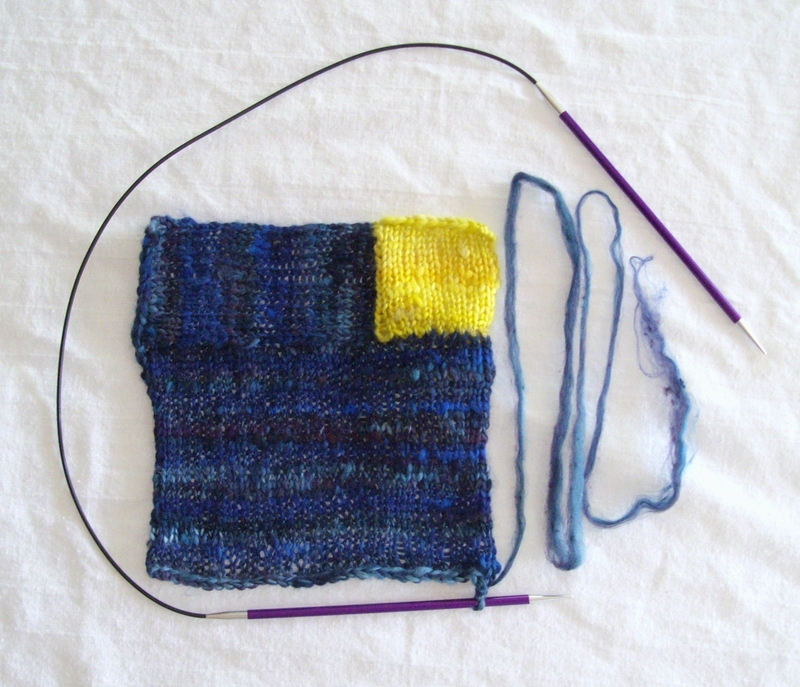 The selvedge rows are the cast on and bind off rows, which are not counted in the math, but are real, actual rows as far as picking up stitches goes.